A Euro-spec left-hand drive model was put through the test – in the standard equipment trim as well as with the optional safety pack. The former scored a faultless four while the latter secured a perfect five! Just last week, PSA announced Citroen’s entry into India with the C5 Aircross towards the end of 2020. The car has been tested by Euro NCAP and has secured a worthy four stars for the standard trim. In this trim, the SUV comes with front and side airbags, seat belt pretensioner, ISOFIX on the passenger and rear seat, speed assistance, lane assist and more. 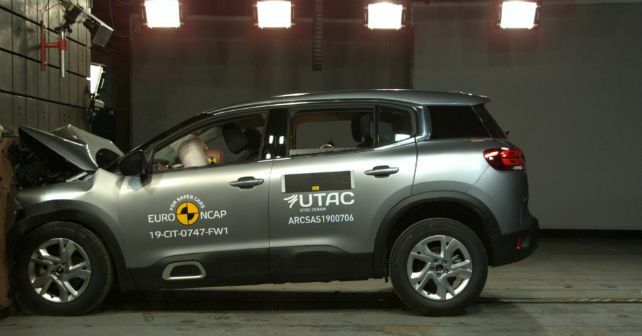 The Euro NCAP report states that the passenger compartment remained stable in the frontal offset test. Dummy readings reflected good protection for the driver and the passenger for the most part. Just the tibia region of the driver showed weak protection, that too just in the frontal offset test. All other tests – full width, whiplash rear impact, and lateral impact – all showed good protection for adult occupants. The tests were also conducted with different sized dummies and the result was identical for all. Even the standard trim of the car comes with autonomous emergency braking (AEB), and it performed up to the mark at low city speeds. Euro NCAP also tested the fully loaded version of the C5 Aircross with the safety pack. This version of the SUV managed a perfect score thanks to the additional equipment it comes with. The safety pack adds AEB Cyclist and a few other features above the standard model.